"When I married a Rhode Island guy, this was a must at holiday time, but we Southerners like it so much, we have it anytime! Meat and potatoes cooked in pie shells. This one's easy and fills them up." In a large skillet over medium high heat, saute the ground beef and sausage for 10 minutes, or until browned. Drain excess fat and transfer to a large bowl. Combine the meat with the onion and mashed potatoes, mixing well. Season with salt and pepper, cinnamon and cloves to taste. Spoon mixture into two pie shells. Cover each with the other pie shell. Remove foil pan from each top pie shell and, using a knife, poke some holes in each top pie shell to vent steam. Bake at 325 degrees F (165 degrees C) for 15 to 20 minutes, or until pie crusts are golden brown. Make this succulent barbequed pork dish in your oven. I use ground pork instead of the beef. I think onion is the trick I use a lot of onion I also throw in a handful of chopped celery. My family eats this on Christmas eve. We love it. This was an easy and quick meal to make that my family just loved. We will definitely have this again soon. Yum Yum...very good and is a company dinner dish adding apple pie for dessert. 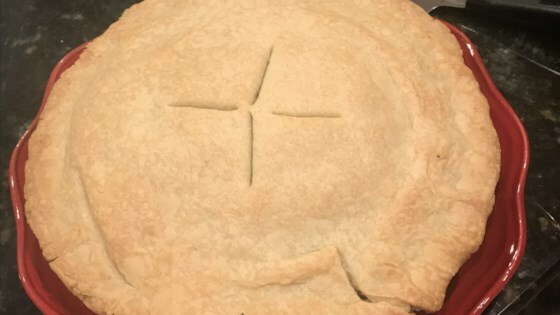 Used this recipe to fill a large 12" glass pie pan with the meat pie. Excellent! Very nice. But why is it called a pork pie? I used breakfast sausage with sage added more sage,cloves, and cinnamon i also added 8 oz to the mix while I as browning the meat mushrooms very good!